Sometimes, the best decision we can make for them is the hardest one on us. That was the case recently when we helped Scarlet, our clouded leopard, pass on. In 2012, we received a request to take in a very special cat, a rare clouded leopard named Scarlet. Scarlet also arrived with special needs and behavioral issues clouded leopards are known for in captivity. But to us, Scarlet was just special because she was Scarlet. When she first arrived, she was elusive and shy, highly stressed and sucked her tail so much her skin was exposed. On top of that, she also had chronic health issues and underwent several treatments and surgeries after arriving at the Sanctuary. With the love of her caregivers, Scarlet blossomed at TWS. Her personality started to shine and she greeted caretakers for meds and meals. She loved sleeping up high in her fire hose hammock and sharpening her nails on the logs. She also liked to forage for her food in trees, teaser balls and even from her suspended toys. Over the past few years, Scarlet became so brave – and even sassy. It was a blessing to see her emotionally doing so well, even though we knew her health was declining. She became a ball of energy and very brave. She even began operant conditioning to encourage her to keep her little paws (and big claws) on the floor vs. reaching for her food. She had stopped over grooming her tail and it had grown back in beautifully. With her adorable face and sweet antics, she continued to become even more special to us and all of our supporters. She was a very smart cat who had a long journey both emotionally and physically. It was bitter sweet to see her emotionally heal while her body deteriorated. We continued to keep a close eye on her and stay ahead of her medical issues to ensure she was comfortable and pain-free. We knew the time would come when her medical challenges would be increasingly closer in occurrence, and we would have to make the decision that was best for her. When that time came and before we could make such a heart-wrenching decision, we determined it was important to have the best medical diagnostics run. We brought her to the University of Minnesota where she underwent a cat scan. At 15, she had already beaten the odds so many times. The tests confirmed our worst fears. Scarlet had little lung capacity left. With her autoimmune issues ever increasing, Scarlet was no longer responding to antibiotic and steroid treatments. With disbelief and much sadness, we knew it was best not to wake her and let her go peacefully. It is so hard to comprehend she is gone. I can still see her little spotted nose and long whiskers greeting us at the fence. And her beautiful long tail being the last glance as she walked into her building. There will never be another Scarlet. She truly was special and will be deeply missed and forever in our hearts. May your journey in your new life be peaceful and pain-free. 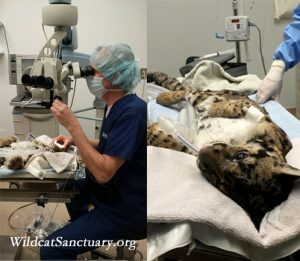 When TWS posted the story of the planned rescue that fell through for Bhutan the Snow Leopard, a curator for a city zoo was inspired to contact the Sanctuary about providing a home for a clouded leopard named Scarlet that needed placement. In 2012, Scarlet was 12 years old and had arrived at the zoo about a year earlier with her male companion. Sadly, her companion died within a few months. Scarlet had been living in an indoor holding area since then and the zoo was having financial troubles, so they were unable to build an outdoor area for her. The curator wanted what was best for Scarlet, so she contacted the Sanctuary. Clouded leopards are considered endangered. 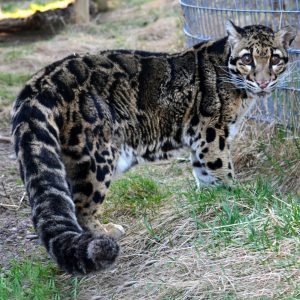 As of 2011, there were only 69 clouded leopards living in 24 institutions that participate in the Clouded Leopard Species Survival Plan. Scarlet is no longer able to breed and is not a part of the Species Survival Plan. She will spend her years in retirement in a large, free-roaming habitat with indoor access at the Sanctuary. Being the best climber in the cat family, she will enjoy tree branches and high platforms in her habitat. 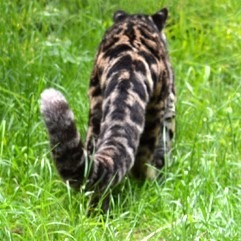 Clouded leopards live throughout the forests of Southeast Asia. The smallest of the big cats, they are secretive and rare in the wild, preferring to remain alone and hidden from view. They have the longest canines and tail, compared to body size. Even though they are small in stature, they are closely related to the big cats vs. small cats. S carlet underwent an intake exam and remained in a quarantine area at the Sanctuary for 30 days before she was released into a free-roaming habitat. Trail cameras were set up to document her activity while she acclimated to her new home. During her intake exam, we discovered some devastating news. A pre-implanted microchip helped us find out more about her past. Being a rare cat, Scarlet was part of the Clouded Leopard studbook where her genealogy was tracked. She bounced around through several breeding facilities and non-accredited zoos and actually was lost in the system. We contacted the SSP to inform them of her whereabouts and status. But the exam also uncovered health issues. Her rear-end was necrotic and swollen and she was incontinent. It was definitely painful and she was self- mutilating due to the discomfort. A tumor on her mammary gland was also discovered and biopsy performed. And the most devastating news was that her initial blood work came back positive for feline leukemia. The feline leukemia virus (FeLV) is a disease that impairs the cat’s immune system and causes certain types of cancer and is contagious between cats. In many organizations, this would be a death sentence for Scarlet. But we owed it to her to perform more tests, treat some of the health issues and see if with the right support, she could begin to heal and continue to have a quality of life. Two weeks later, a follow-up exam was performed. Her back-end had dramatically improved with antibiotics and pain medication. The infection had subsided and inflammation decreased. The mammary tumor was malignant, but our vets felt they had clear tissue margins and the prognosis was good. And the second IFA feline leukemia test came back negative which meant she has exposure to the disease but currently not shedding the disease. Our team made the decision that she deserves the best chance at a good life at TWS. But it will take special care to provide for her. Because Feline leukemia is spread by close and persistent contact between infected and non-infected cats, Scarlet will now require a permanent habitat that is separated from the rest of the TWS population to ensure the disease cannot spread to the other cats. In addition, she will need to be officially quarantined in terms of care, utensils and feeding. She was temporarily moved indoors for ongoing observation. Our vision for her permanent enclosure will provide her an indoor shift area, a 2000 square foot enclosure that has ample landscaping for coverage for her shy nature, logs to climb and claw, and hammocks to lounge on. Given her future enclosure site is in the quarantine area, only a small team can work on the construction. Outsourcing the enclosure vs. volunteers building it will ensure it is erected quickly with the least possible chance of cross contamination to our other residents. The fence company completed the new fencing of her habitat in January 2013 while a fundraising campaign began to finish paying for the rest of her planned new home. You can help by becoming Scarlet’s sponsor parent today or by donating to the general fund for her habitat. When we are able to provide a home to another cat in need, we breathe a sigh of relief each time they reach our front door. Once they are here, we can provide them a life of solace, health and compassion. So, when a rescue comes through our door like Scarlet the Clouded leopard, we will do whatever it takes to provide her the best life we possibly can. And we know you will be there to help us. Clouded leopards are listed as endangered by the US Fish and Wildlife Service under the United States Endangered Species Act. As of 2011, there were only 69 clouded leopards living in 24 institutions that participate in the Clouded Leopard Species Survival Plan. We were thrilled to provide Scarlet the retirement home she deserved. Once here, she was moved into quarantine with a heated den and plenty of logs and perches to climb. Scarlet also underwent her intake exam. During her exam, we discovered some devastating news. A pre-implanted microchip helped us find out more about her past. 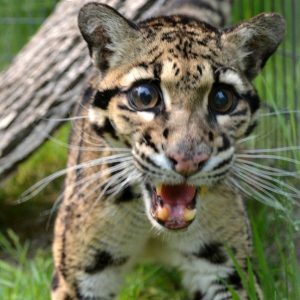 Being a rare cat, Scarlet was part of the Clouded Leopard studbook where her genealogy was tracked. She bounced around through several breeding facilities and non-accredited zoos and actually was lost in the system. Scarlet finally ended up at The Wildcat Sanctuary and we contacted the Species Survival Plan administrator to inform them of her whereabouts and status. But the exam also uncovered health issues. Her rear-end was necrotic and swollen, most likely from a combination of over breeding and being incontinent. It was definitely painful and she was self mutilating due to the discomfort. A tumor on her mammary gland was also discovered and biopsy performed. And the most devastating news was that her initial blood work came back positive for Feline Leukemia. The Feline Leukemia virus (FeLV) is a disease that impairs the cat’s immune system and causes certain types of cancer and is contagious between cats. In many organizations, this would be a death sentence for Scarlet. But we owed it to her to perform more tests, treat some of the health issues and see if, with the right support, she could begin to heal and continue to have a quality of life. Two weeks later, a follow-up exam was performed. Her back-end had dramatically improved with antibiotics and pain medication. The infection had subsided and inflammation decreased. The mammary tumor was malignant, but our vets felt they had gotten clear tissue margins when they removed it and the prognosis was good. 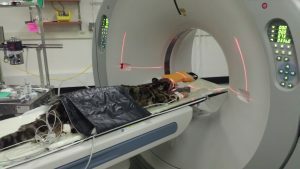 The second IFA Feline Leukemia test came back negative which meant she has exposure to the disease, but currently is not shedding the disease. Our team made the decision that she deserves the best chance at a good life at TWS. But it will take special care to provide for her. And this is where you can help. Because Feline Leukemia is spread by close and persistent contact between infected and non-infected cats, Scarlet will need a permanent habitat that is separated from the rest of the TWS population to ensure the disease cannot spread to the other cats. In addition, she will need to be officially quarantined in terms of care, utensils and feeding. She has been temporarily moved indoors for ongoing observation. Our vision for her permanent enclosure will be to provide her an indoor shift area as well as a 2000 sq foot enclosure that has ample landscaping for coverage for her shy nature, logs to climb and claw, and a hammock to lounge on. The sooner we can raise the funds, the sooner Scarlet can begin enjoying her permanent habitat and new life at TWS. Given the construction site is in the quarantine area, only a small team can work on the construction. Outsourcing the enclosure vs. volunteers building it will ensure it is erected quickly with the least possible chance of cross contamination to our other residents. The fence company can begin to work on her new habitat the last week of January. You can help Scarlet TODAY! For those of you who don’t know Scarlet’s story, she came to us with a horrible infection on her rear end. This was likely due to incontinence which could be from a genetic malformation. We have been treating this with antibiotics for months and finally it was cleared up enough for her to undergo surgery for a more permanent health solution. Thanks to Dr. Scott Hammel of Veterinary Surgical Specialists, Scarlet can now enjoy life pain free. Dr. Hammel performed an epiosoplasty which will allow Scarlet to urinate more freely thus preventing urine building up on her rear end causing the infection. Scarlet has endured so much in her lifetime that finally giving her this basic freedom from pain is truly a blessing. Her surgery went very well and she is on the road to recovery. She will receive a check-up in two weeks to make sure everything is healing as it should be. The future here for Scarlet looks bright. We are currently working on her new habitat and as soon as she is all healed she will be free to enjoy the great outdoors once again. Two of our fantastic volunteers built her a special log jungle gym to stretch her wild side on, with high climbing logs and private coves to lounge under. Scarlet remains a very private, shy cat but we are hoping that with her new pain free life and new habitat to explore she will break out of her shell be the wild cat she deserves to be. Emergency surgery was performed on Scarlet the clouded leopard today after a medical exam confirmed pyometra. Pyometra is an infection of the uterus that occurs because of hormonal changes in a cat’s reproductive tract. Scarlet is not spayed unlike the majority of our residents who are spayed/neutered upon arriving at the sanctuary. That decision was made by medical experts since Scarlet had so many other health issues that needed immediate attention when she arrived at the Sanctuary. Scarlet is receiving the best of care and being monitored ongoing by her caregivers. With so many supporters, we are hoping each of you will send good thoughts for a quick recovery. We are optimistic but also realize this was a serious surgery. Scarlet, who arrived shy and elusive, has come out of her shell. She naps up high on her hammock and loves to scratch her log. We hope she will be back out in her habitat very soon. Recently, it was observed that Scarlet’s eye appeared to be cloudy. She underwent surgery for a luxating lens that was removed. Her opthamologist felt that Scarlet should regain the majority of her vision back in the eye. The surgery was successful and has a short recovery period. Scarlet was able to return to her habitat and get back to her daily routine within a few days.